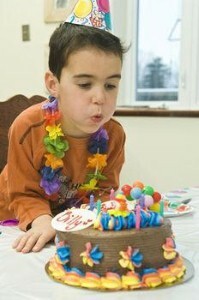 Throwing your child a fun and memorable birthday party does not have to cost hundreds of dollars. Fathers should not feel the pressure to compete with (and one-up!) the last party their kids attended by spending a lot of money on invitations, decorations, entertainment and food. Instead of expensive custom-made invitations, try making your own. Check out examples of costly invitations online and see if you and your child can recreate them using your home computer and some art supplies. Hosting the party at home is another parenting tip to keep costs down. If you don’t have enough room to accommodate your child’s friends, consider a park or other public place instead. Some libraries or community centers also offer room rentals at a low price. Planning the party around meal times and just serving cake and ice cream can save a lot of money as well. A homemade cake or cupcakes that the party-goers can decorate themselves will be much less expensive than a professionally made cake as well. Forget about hiring the entertainment. Plan lots of games and activities to keep the kids busy and enlist the help of some friends or family members to keep everything organized and fun. Old favorites like musical chairs and Pin the Tail on the Donkey as well as organizing an obstacle course or scavenger hunt can be a lot of fun too.